A huge boxing event is right on the horizon. 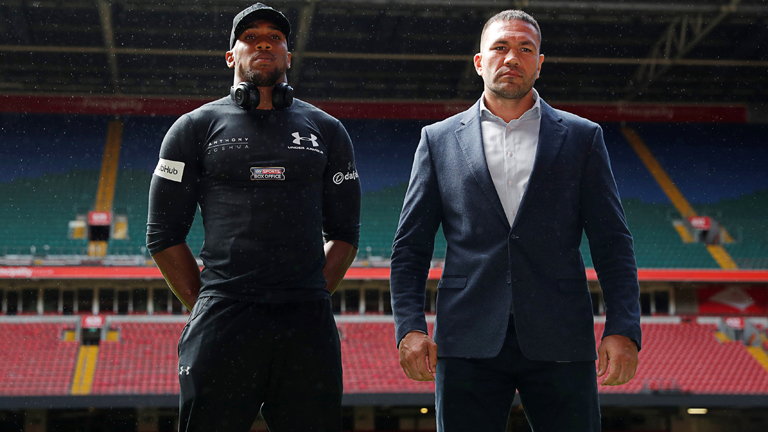 On March 31st, 2018, two undefeated heavyweight champions will square off in the very much anticipated unification fight at the Principality Stadium in Cardiff, UK. WBA/IBF champion Anthony Joshua’s match against Joseph Parker is going to give a definitive answer to the question on everyone’s minds about who is going to come up as the dominant heavyweight boxer of this generation. This article will provide you with a quick evaluation of each boxer, and the Joshua Parker predictions on each fighter’s odds of lifting all three belts. The massive title unification bout between two of the best heavyweight fighters in the world is one that no fan will want to miss. Both Anthony Joshua and Joseph Parker enter this match undefeated in their careers. They hold a combined 44-0 record with 38 knockouts. Joshua is the IBF, WBA Super, and IBO heavyweight champion and opened as a -1200 favorite. Parker is the WBO heavyweight champion, and he came back at +700. All of Joshua’s 20 career wins came by knockout, and 16 of his opponents never saw the fourth round. He is considered by many to be more naturally gifted than any other current heavyweight fighters. Although he has some excellent fundamentals, this former Olympic gold medalist’s game is really built around his power. Parker, on the other hand, is part of a new wave of heavyweight boxers. Although he isn’t as well known as AJ, he is still under 25 years of age, undefeated, and has faced stiffer competition and come out on top. This undefeated Kiwi’s key to beating AJ is to work his jab often, push the pace and avoid getting stuck on the ropes. Joshua is the current WBA and IBF heavyweight champion, and when he collides with Parker, he has the opportunity to add the WBO title to his impressive list of achievements. As far as Joshua Parker predictions go, this is expected to be one of the most intense showdowns we’ve seen in a while, and the amount of Joshua Parker betting at both online and off-line bookmakers is already at a staggering level. Joshua opened up as 1/12 favorite for this bout, with high expectations to easily extend his unbeaten record to 21. On the other hand, Parker received 6/1 odds to cause an upset, walking out of the stadium with all of Joshua’s belts. Looking at the past records of both boxers, Joshua is obviously the more experienced and has faced (and beaten) more difficult opponents in his career up to now, including some boxing greats like Dillian Whyte and Wladimir Klitschko. On the other hand, the only big name that Parker has beaten is Andy Ruiz when he won his WBO title in 2016. With just a few weeks remaining before the fight, and the astounding level of interest in the match, there is still time enough for the odds to change in the Joshua Parker predictions, and it’s to be expected that a lot of money will be placed on each of these two fighters. It would be wise to monitor this situation wisely, and take action when the odds look good for your preferred boxer. As you well know, a well-timed bet could yield a lot more.